Regardless of the assigned biosafety level, caution should be used when working with any microbial culture. 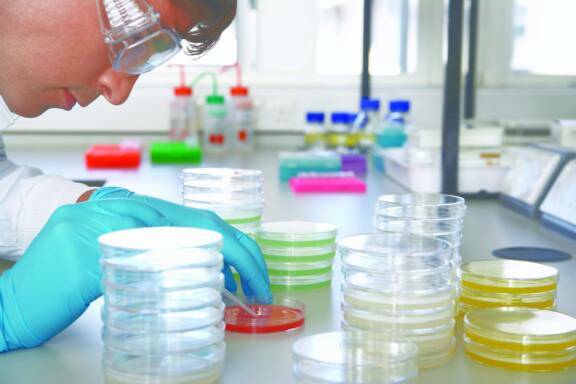 Below we describe eight expert tips on how to handle microbial strains to prevent culture contamination and promote the safety of laboratory personnel. Obtain microbial strains from an authenticated, trusted source. Research laboratories run the risk of misidentified or contaminated strains when using microbial cultures obtained from colleagues. Before working with media and microbial cultures, sanitize your hands and work area with an appropriate disinfectant. Disinfectants are commonly applied to laboratory surfaces to destroy any present microorganism by denaturing proteins or disrupting the cell membrane. Ethanol, a frequently used laboratory sanitizing agent, is commonly prepared at a 70% concentration in sterile water to facilitate diffusion through the cell membrane. Ethanol functions as a disinfectant by denaturing both external and internal proteins of contaminating microorganisms. Ensure you are wearing appropriate sterile, protective clothing. This will protect you from the culture as well as reduce accidental culture contamination. It is recommended that laboratory scientists don a fitted laboratory coat, disposable gloves and shoe coverings, safety glasses or a face mask, and closed-foot shoes. Individuals with longer hair are urged to pull back their hair or use a hair cover to prevent potential health hazards when working near an open flame as well as to prevent possible culture contamination. To aid in the prevention of culture contamination, all glassware, equipment, media, and reagents should be sterilized prior to use by either filter-sterilization or use of an autoclave. Handle only one microbial culture at a time. The risk of cross contamination or misidentification increases when more than one strain is handled at a time. Additionally, when handling a microbial culture, work quickly and carefully in an environment that has minimal distractions. Avoid passaging and subculturing microbial strains too many times. Many microbial cultures, particularly bacterial strains, quickly succumb to genetic drift, often resulting in major phenotypic changes. Multiple passages of a strain can increase the risk of genetic drift as well as the potential for contamination. Starting fresh microbial cultures from preserved, low-passaged stocks is recommended rather than continual subculturing. Inspect cultures daily for signs of cross-contamination. On agar plates, contamination can be visualized through variations in colony morphology. In liquid media, contamination can be more difficult to visualize and may require microscopy or plating to observe morphology. Strains should be preserved as low-passaged cultures grown under optimal growth conditions. Cultures should be tested empirically for ideal preservation conditions to ensure the extended viability of the strain.